When it comes to digital voice assistants, Amazon’s Alexa has completely dominated the smart speaker market with the Amazon Echo decidedly being the gadget of choice. According to eMarketer, the forecasted number of smart speakers in the UK alone will grow by a third this year, with a growth rate from 9.5 million in 2018 to 12.5 million in 2019. This is a growth of 31.6% and while Amazon won’t control all of those speakers, two-thirds will be using the Amazon Echo while Google Home brings up second in choice. To put this in perspective, as of late 2018, the Amazon Echo was installed in 63% of U.S. homes according to Statista. Now, large companies like Razer, Sony, Lenovo, and Kohler are looking to take advantage of this mass adoption and have unveiled at CES 2019, that they will be integrating Amazon Alexa’s voice skills into their products. The company is looking to bring new voice and touch features to its platform as a way to bring it into the next generation of high-end computing and gaming experience. According to the company representative at CES, they will be integrating Amazon Alexa Skills into the platform to allow gamers to control certain aspects of the entire Razer gaming experience. Although the integration is not due until the second quarter of 2019, it will be about controlling what happens around your gaming experience, primarily enhancing it and creating a network between Razer peripherals. Some features include using Alexa voice commands to control lighting effects and device settings. It is worth mentioning that the peripherals will be able to take full advantage of Alexa’s capabilities, including being able to access the thousands of skill apps available on the skill apps store and have the ability to manage all smart devices connected within the network. 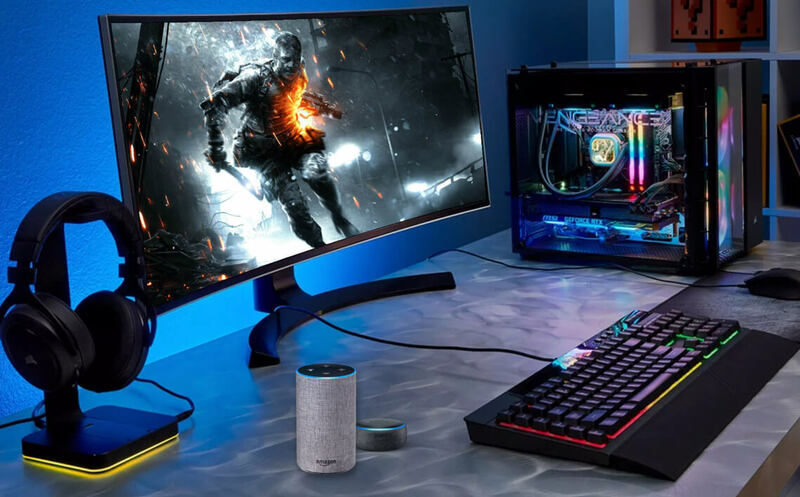 Alexa will be brought into the Razer peripheral family through the Razer Synapse 3 Internet of Things platform, which will also utilize the haptic systems of HyperSense; Razer’s touch-based gaming experience that aims to provide an authentic gaming experience. Sony revealed at the CES press conference that they will also be adopting Alexa into one of their well-received product lineups, the WH-1000XM3’s. These use noise-cancelling technology, adaptive sound control, and smart features like touch control, quick attention, and of course, voice assistant compatibility. They come wired or wireless, have a dedicated NC processor, and a sense engine that automatically adjusts the ambient sound settings to your situation. The firmware update will be released during the first quarter of 2019 after which Alexa will be available by the tap of a button. Alexa will be able to perform a myriad of playback tasks, such as smart assistant fare, changing tracks, and playing music. The firmware update will also be available with the WH-1000XM2 and WH-1000X in-ear model. Finally, the update will also bring the ability to connect your headphones for home device control. Lenovo wants in on the Amazon Alexa craze and has announced two tablet devices for sale that will utilize the smart assistant. Launched in January 2019, one can pick up the Smart Tab M10 and P10, which both ship with the new Smart Dock. Both are 10.1-inch tablets, are non-Amazon Fire, and comes with a Show Mode for Echo Show capability. The Smart Dock comes with three-watt speakers and a built-in microphone, so you can use Amazon Alexa’s voice skill apps if you please. The tablets are being positioned as a “travel” Echo Show, as the tablet is certainly a lot more portable than say your smart assistant device at home. The P10 has a light, thin, and slick design with 4GB of ram, 64GB of storage space, and a 7,000mAh battery, while the M10 is more of a family-friendly tablet. The Numi 2.0 is a home toilet that aims to make you forget that you are sitting on a toilet by immersing you into an environment of tranquility. It does this by using dynamic ambient lighting systems, surround sound speakers, and personalized cleansing, drying, and heated seat functions. The Numi 2.0 is part of the Kohler Konnect platform, which aims to create the world’s smartest bathroom by using built-in voice control over sound, lighting, color, and water. Although it is unlikely that voice assisted applications will become completely ubiquitous in 2019, the fact that large companies like Kohler and Razer are choosing to adopt Alexa into their products goes to show that we are on the cusp of some very innovative products in the future. With Alexa skills being integrated into smart peripherals, and intelligent bathrooms, we will soon see the use of voice everywhere. How Lets Nurture can help Integrating Alexa Skills with Mainstream Tech Giants? Being an ISO 9001:2015 certified top Alexa Development company in USA, India, Canada, UK and Australia, Let’s Nurture has its expertise in delivering innovative business-driven solutions using Voice enabled technology and devices. Our team has expertise on running skills like: AWS like Lambda, CloudWatch and S3 and has fostered services to many industries including E-commerce, Content Management and Home Automation. Hire dedicated Alexa skill developers from a top offshore Alexa development company that ensures to give you results for your business growth in the best way possible. Get in touch now!